Do Broccoli Stems Have Nutritional Value? 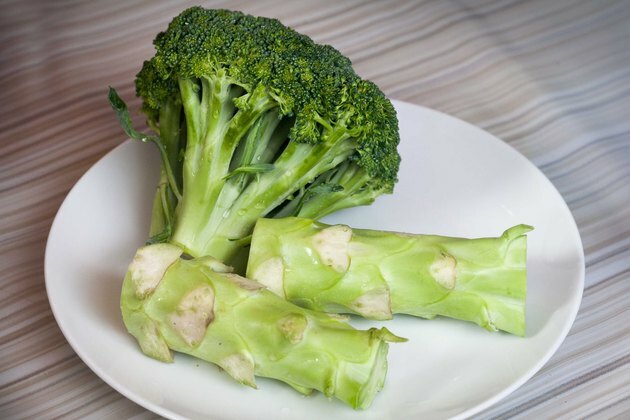 Chopping broccoli into bite-sized broccoli florets is aesthetically appealing, but if you throw away the broccoli stalks, your family is missing out on essential vitamins and nutrients. Broccoli stalks are edible and nutritious by themselves, or served along with the rest of the broccoli crown. Consult your doctor before making any changes in your diet, especially if you have allergies or health conditions. Broccoli florets are small, chopped portions of the head, or crown of the broccoli. Broccoli florets are most often used in recipes because they are small and pleasing to the eye. The broccoli stalk, which is smooth and a lighter green color than the broccoli crown, is large, cumbersome, and requires peeling; it is often thrown away. The broccoli stalk, or stem, is just as nutritious as the broccoli crown, and is simple to prepare and cook. Broccoli stems are as nutritious as the broccoli crown. 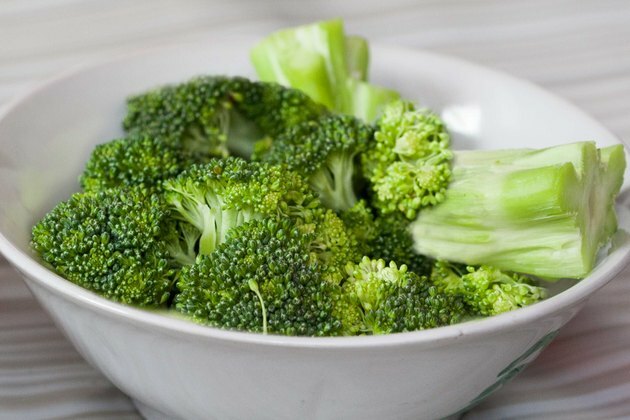 One hundred grams of broccoli stems contains 28 calories, 2.98 grams of protein, 48 milligrams of calcium, .88 milligrams of iron, 25 milligrams of magnesium, 325 milligrams of potassium, 27 milligrams of sodium and 400 IU of vitamin A. One hundred grams of broccoli florets contains identical nutrition information, making broccoli stems just as healthy and vitamin-packed as the more visually appealing broccoli florets. If your family turns their nose up at broccoli stalks, incorporate them along with the broccoli florets into a healthy recipe. 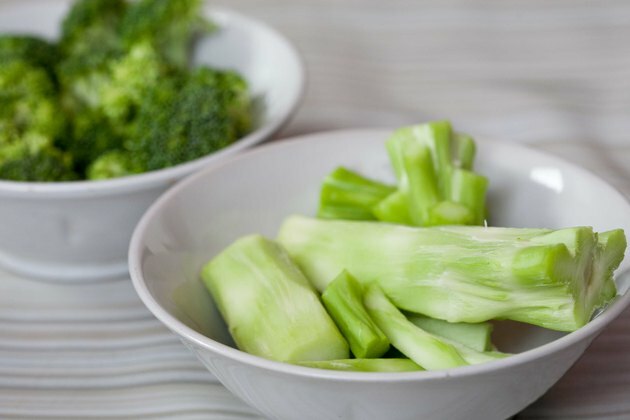 Broccoli stalks take longer to cook than florets, so peel the stalks and cut them in half before cooking to increase the surface area of the vegetable. Saute them for use in casseroles or soups, or roast broccoli stems, lightly coated in a mixture of olive oil and minced garlic, until tender. 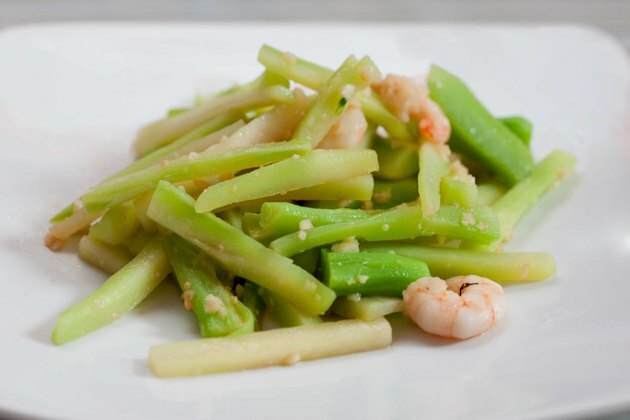 If you've got a fridge full of broccoli stalks, don't throw them away. Instead, peel and chop them to use in a stir fry, or grill them on skewers with chicken, pineapple and bell peppers. Sneak some extra nutrition in to your family's meals by pureeing the broccoli stalks, then adding them to spaghetti sauce. 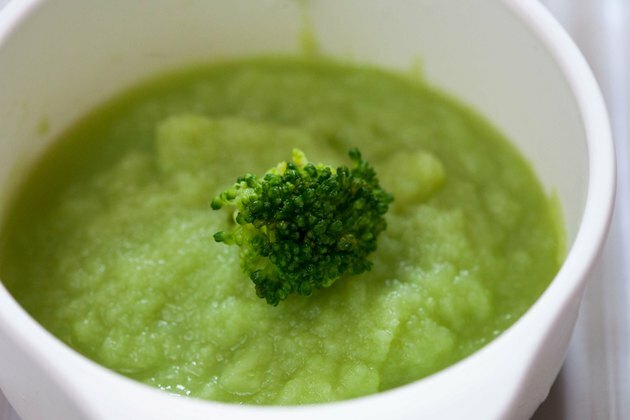 Make your own baby food by pureeing broccoli stalks in a blender, recommends Mother Nature Network in the article "Kitchen Recycling Tip: Broccoli Stems." What is a Serving Size of Broccoli? What Are the Benefits of Eating Broccoli Every Day?